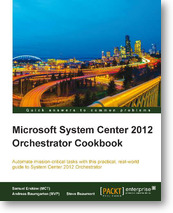 A few months ago, I was contacted by the publisher of Microsoft System Center 2012 Orchestrator Cookbook and was asked if I'd live to review a copy on my blog. Since I spend most of my professional life deploying Service Manager and Orchestrator, I thought it was a great opportunity. It's currently on sale for $5 in eBook format for the holiday season and can be purchased at the Packt Publishing site. As some of you that follow me on Twitter may already know, there are promo codes for free VMware VCA certifications floating around. Not only does that make these entry-level certifications free, but you can even test for them at home, on your own computer, right in the browser of your choice with no additional software necessary. The combination of free plus a low barrier to entry makes these a quick and easy choice for someone that doesn't do much VMware work, but wants to stay diverse. Deduplication is probably one of the coolest features in Windows Server 2012 and I haven't written about it yet. Until now! Fans of enterprise storage have grown to love deduplication for the massive space savings is can bring on things like volumes that host VMs or backup archives. The problem has been that there is a high barrier to entry for a lot of SMBs that can't necessarily afford the proper hardware and/or licensing to use deduplication properly. In some cases, these organizations will roll out a ZFS solution. ZFS on Linux is a relatively new development, so up until very recently, it would require a Solaris derivative or a BSD that was not encumbered by the GPL license. Because of this, many smaller organizations have skipped deduplication in favor of just buying more disks. Well, now the wait is over. In Server 2012, deduplication is baked into the OS for no additional cost and is incredibly easy to configure and get rolling with. Check out the YouTube video after the break for a quick walkthrough on setting up some basic deduplication settings on your Windows Server 2012 file server. The script in this post will get you started in using PowerShell scripts to automate your user account creation. It has very basic functionality so far. It takes the username as input from the user. It also asks if you'd like to copy the group membership of an existing user. It then creates a new user in the default container with the appropriate group membership.